Figure 1: Adult Golden Eagle at left; first year Bald Eagle at right. Examining the build of the birds from head to tail, then wingtip-to-wingtip, we can see that the Golden has a proportionately small head and bill (combined, a small head GISS) and a proportionately longer tail compared to the Bald. From wingtip-to-wingtip, we see that the Golden has slightly slimmer ‘hands’ and a lightly lobed, curvaceous trailing edge to its wings, a feature derived from bulging secondaries and a ‘pinch in’ at the wing base; the Bald has broader wings in general and lacks the lobed, curvaceous features along the trailing edge. Examining the plumage of the two, the banded remiges (flight feathers) and fully banded tail lacking a white base signifies a full adult for the Golden and the brown belly, even trailing edge to the wings (lacking the jagged look of longer juvenal feathers jutting past shorter second generation feathers) and white mottling throughout the underwing signifies juvenile (1st year) for the Bald. 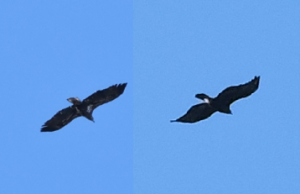 Figure 2: A composite of “brown” eagles coasting away from the observer. Sub-adult III Bald Eagle at left; adult Golden Eagle at right. What differences in shape and proportions do you see? Apply the same (or a similar) analysis using the ID checkpoints above. Liguori, J. 2005. Hawks from Every Angle. Princeton University Press, Princeton, New Jersey.